Plant pathogenic bacteria, oomycetes, fungi, and nematodes secrete an arsenal of effector proteins that modulate plant innate immunity and enable parasitic infection. Deciphering the biochemical activities of effectors to understand how pathogens successfully colonize and reproduce on their host plants has become a driving paradigm in the field of molecular plant pathology. In the last three years, unparalleled progress has been made in understanding effector biology in the oomycetes. The identification of a vast repertoire of secreted oomycete proteins and their subsequent characterization led to the classification of effectors based on their target site in the host. 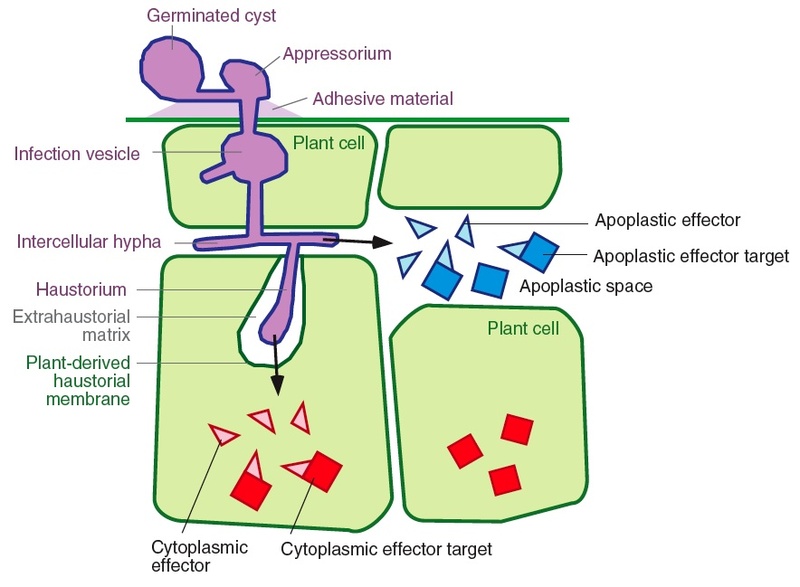 Apoplastic effectors are secreted into the plant extracellular space, while cytoplasmic effectors are translocated inside the plant cell, where they target different subcellular compartments. Understanding the perturbations caused by oomycete effectors should prove critical for unravelling mechanisms of pathogenicity, as well as further illuminate novel aspects of plant defense and innate immunity. Of particular interest are the activities of the RXLR and CRN 'Crinkler' families of cytoplasmic effectors that are characterized by conserved motifs following the signal peptide. How do they operate to reprogram host defenses? What are their host substrates? How did they coevolve with host proteins? There is emerging evidence that delivery of oomycete proteins inside plant cells may take place, possibly through infection vesicles and haustoria. For example, a common feature of all known oomycete Avr proteins, such as AVR3a, is that they function inside host cells. We study the mechanisms of effector protein translocation inside host cells, arguably one of the most critical questions in the study of eukaryotic plant pathogens. Recent findings offer new avenues on how to tackle this problem. RXLR cytoplasmic effectors are characterized by a highly conserved N-terminal sequence motif that is positioned within sixty amino acids of the signal sequence. This motif appears to function in translocation of effectors into the host cytoplasm. Indeed, these Phytophthora motifs are similar to and functionally interchangeable with a host-targeting signal that is required for translocation of proteins from malaria parasites (Plasmodium species) into the cytoplasm of host cells. These findings raise the possibility that plant and animal eukaryotic pathogens share similar mechanisms for effector secretion inside host cells. We are exploiting these findings to study the machinery of effector trafficking using structure-function and cellular localization analyses. Morgan, W., and Kamoun, S. 2007. RXLR effectors of plant pathogenic oomycetes. Current Opinion in Microbiology, in press. Win, J, Morgan, W., Bos, J., Krasileva, K.V., Cano, L.M., Chaparro-Garcia, A., Ammar, R., Staskawicz, B.J., and Kamoun, S. 2007. Adaptive evolution has targeted the C-terminal domain of the RXLR effectors of plant pathogenic oomycetes. Plant Cell, 19:2349-2369. Supplementary Material. Bhattacharjee, S., Hiller, L. N., Liolios, K., Win, J., Kanneganti, T. -D., Young, C., Kamoun, S., and Haldar, K. 2006. The malarial host-targeting signal is conserved in the Irish potato famine pathogen. PLoS Pathogens 2:e50. Armstrong, M.R., Whisson, S.C., Pritchard, L., Bos, J.I.B., Venter, E., Avrova, A.O., Rehmany, A.P., B�hme, U., Brooks, K., Cherevach, I., Hamlin, N., White, B., Fraser, A., Lord, A., Quail, M.A., Churcher, C., Hall, N., Berriman, M., Huang, S., Kamoun, S., Beynon, J.L., and Birch, P.R.J. 2005. 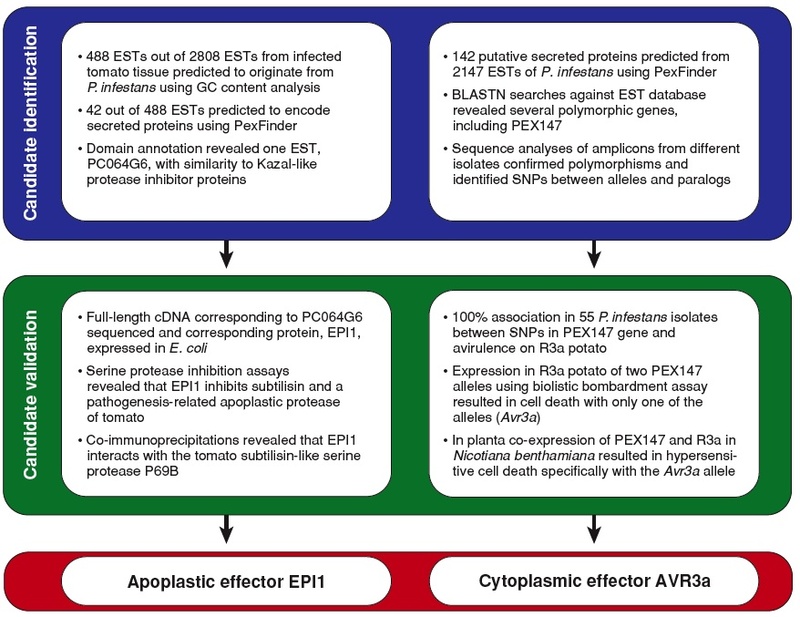 An ancestral oomycete locus contains late blight avirulence gene Avr3a, encoding a protein that is recognized in the host cytoplasm. Proceedings of the National Academy of Sciences USA, 102:7766-7771.